A Florida Republican often touted as a possible 2012 vice-presidential candidate has admitted his Cuban parents did not come to the US as exiles from Fidel Castro's rule. Senator Marco Rubio acknowledges "getting a few dates wrong" about when they left the Caribbean island. But the 40-year-old says any suggestion he had spun his background story for political advantage was "outrageous". He maintains communism in Cuba was a defining event in his parents' lives. The Washington Post reported on Friday, after examining official records and naturalisation documents, that Mr Rubio's parents had obtained US residence more than two years before Castro took power in 1959. An entry on his official Senate website saying he is the son of "Cuban born parents who came to America following Fidel Castro's takeover" has now been amended. The Tea Party favourite has also said in the past that his parents left Cuba before its revolution. 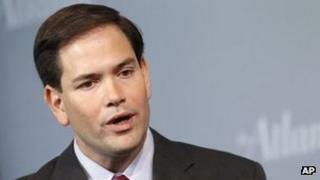 The first-term senator conceded on Friday that his parents had not come to the US after Castro took power. Miami-born Mr Rubio wrote in a column for Politico.com: "If The Washington Post wants to criticize me for getting a few dates wrong, I accept that." But he added that the report had made "outrageous allegations". "To call into question the central and defining event of my parents' young lives - the fact that a brutal communist dictator took control of their homeland and they were never able to return - is something I will not tolerate," he wrote. In his article, Mr Rubio said the discrepancy in dates would not tarnish his appeal with voters. "They voted for me because, as the son of immigrants, I know how special America really is."